The home of Julian Eltinge at 2328 Baxter Street in Silver Lake is barely visible from the street. Note: While trolling EBay, I found yet another article that had been cut from a magazine, in this case, the Architectural Record of February 1921. I will say again: Vandalizing books and magazines for such purposes is an abomination. And besides, the article question – a visit to the home of Julian Eltinge – is available online for free from Archive.org. Eltinge (d. 1941) was perhaps the preeminent female impersonator of his era. His lavish home is at 2328 Baxter St., but virtually impossible to see from the street. baron’s home or to some impregnable fortress that had been so placed for defensive purposes. for many genial persons have loved seclusion in their homes, and there were ample additional reasons for selecting the site on account of its remarkable views. Although situated in the midst of Los Angeles, in fact not more than ten minutes’ ride from its very center, the views are such as to make it seem miles from any large city. The approach to what was originally intended to be the main entrance gates leads up a street at a terrific grade. At its top it immediately drops again at an even more frightful angle ; and it is down this latter dangerous descent that one would have to start were one to attempt to enter the grounds with a car. Soon after starting, the driver would have to swerve, drop into what looks something like the dry moat of a castle, and then if he were still in equilibrium take a gambler’s chance of running through the gates on the opposite side. Fortunately there is another entrance and a safer approach (albeit not so picturesque a one) on another street. When one finally reaches the spot, however, one is amply repaid for the effort. The views are incomparable. I recently had sent me from abroad some colored postal cards showing views of the Italian lakes. They were taken through columned balconies looking out over shimmering bodies of water surrounded by little villages and further on by beautiful snow-capped mountains. The views from the Eltinge place remind me of those of the Italian lakes. By a fortunate arrangement of topography they comprise a beautiful inland lake, rolling hills beyond it with here and there little villa tucked away amongst them, and beyond those a range of mountains also frequently covered with snow. Mr. Eltinge’s garden largely commands these views and is distinctive and unusual in consequence. 1 once heard it said that a garden should never be placed where there is a fine view on account of the danger of the view and the garden competing. 1 do not think that is true. Some of the finest gardens in the world are at Ravello, where the outlook over Amalfi and the Mediterranean is wonderful, and both they and Mr. Eltinge’s garden are refutations of any such theory. I think rather that a garden may be one of two different things. It may be either a place built around and dependent for its success upon flowers (in which case the aforesaid theory might somewhat hold) or it may be principally a place of observation, but adorned with greenery, etc., as an adjunct in order to make it beautiful. The Eltinge garden to a certain extent includes both of these types. One portion of the grounds from which the views are less inclusive is walled in by itself and is laid out in flower beds; another with finer views has few if any flowers but has been embellished in way which make it very beautiful. This portion lies several flights of steps below the other and the marked difference in elevation, and perhaps also a large octagonal fountain one passes on the way (situated amidst luxuriant arboreal growth), recalls similar effects in the Villa d’Este at Tivoli. Extending down the center of this lower garden is a long rectangular pool, beyond which is a vine-covered pergola backed up against one of the walls surrounding the grounds. At the opposite end is a raised terrace in the middle of which the aforesaid fountain is located, and back of this fountain is a beautiful fragment of sculpture rescued from the Court of Abundance at the San Francisco Fair. The forecourt of the grounds is midway in elevation between the upper flower garden and the lower garden just described and commands the same fine views. It was originally intended, of course, for the reception of automobiles, but now since so few of Mr. Eltinge’s guests have shown themselves to be daredevils, is no longer used for that purpose. It seems to me that in consequence it might well some day be converted into a very charming out-of-door sitting space, paved, and fitted up with chairs, tables, awnings, etc., in order to bring it more in keeping with its present altered purpose. This is merely a suggestion, however, for it is very good-looking and tells an interesting story as it is. The style of the Eltinge house is the so-called “Spanish” now so much in vogue in Southern California. The outstanding features of the design are a centrally located tower over the entrance, a graceful recessed balcony in the upper portion of this tower, a long row of huge mediaeval looking corbels at one side, a good-looking covered balcony at one end, and an arched porch at the other end. Right here perhaps a brief digression may be ventured. Myriads of houses presumably in this same Spanish style are now being built in Southern California in which certain ear-marks of the style are being copied from the more successful examples, but in which its spirit (the result of skilful design and careful handling of detail) is totally lacking. In several of the good examples certain departures in the way of color and texture were made, and made with success. In the poor imitations I refer to these departures were copied, but not with intelligence and good taste, and the result well, plaster surfaces in which the trowel marks are emphasized out of all semblance to naturalness, walls tinted various shades of cold raw pink, and roofs covered with tile so widely differing in color that one striking example has been appropriately clubbed “the house with the snakeskin roof” such eccentricities combined with very ordinary design and meaningless detail do not make good houses, and some day 1 hope more people than now will realize that fact. The same thing is happening as happened with the Mission style. The original Missions were and are, of course, beautiful, but many imitations which followed were so poor that the style soon fell into disrepute. And so with this Spanish style. Mr. Eltinge’s house and many other fine examples will always be beautiful, but so many have followed which are not beautiful that already the general impression being created by them in Southern California is unpleasant. No other style seems quite so appropriate, and I doubt if any can quite fill its place; so perhaps the public will have to discriminate between the good and the poor, as it has had to do with the Colonial, the English and other types of architecture. house. It could also be said, however, that a man’s house might fairly be interpreted by a man. With that as an excuse, therefore, I shall proceed to describe it. One enters a circular hall which has a brick floor and a winding staircase running up on one side. The steps of the stairs are of brick and there is a wrought iron handrail, which has been touched up with polychrome and gold here and there. At the top of the stairs is a lovely little wrought iron balcony, which overlooks the entrance door below, and from which Mr. Eltinge could welcome his guests if he chose without coming downstairs and before they mounted to the more intimate rooms above. Overhead is a domed ceiling entirely covered with mural paintings, which have been so treated as to appear about a thousand years old. The plastered walls have been done in such a way as to show the trowel marks slightly and have been colored a warm bluish gray to tone in with the ceiling. There is no great amount of light in the hall, not much being necessary ; there are no pictures and their absence is not felt. There are four niches, in which have been placed well selected figures of bronze. Just enough light filters through the few narrow high windows properly to illumine the ceiling paintings and carry out the effect of a dim, misty, but attractive interior. I should have stated that a considerable flight of steps leads from the level of the outer forecourt up to that of the entrance door. From there one mounts a full story’s height in order to reach the level of a hall above from which several more steps lead down to the living room. The effect of these various flights of steps is to contribute greatly toward picturesqueness and the unusual. Some women might not like them but this is not a woman’s house! The living room has a high, partially vaulted ceiling entirely covered with murals, also made to appear old. There is a large, high, good-looking stone mantel of Italian design on one side, a very lovely covered balcony at one end (with an outlook from it toward the lake and mountains), a very finely designed piano, also antiqued, a beautiful harp, some large well selected pieces of tapestry, and much equally well selected bric-a-brac, all of which looks as though it belonged where it stands. These latter things are not architecture, but architecture without some such properly combined adjuncts is a bald and lifeless thing; and many a house, good architecturally, has been rendered ineffective for a lack of them. The success of the Eltinge house is in fact due not alone to its architecture but to a combination of influences all playing their part toward a beautiful whole. These were the choice of able architects, the discovery of a clever decorator, a Mr. Martin Syvertson, who had been working on the outside as a house painter but had been a mural decorator at the San Francisco Fair ; a very capable landscape man, Mr. Charles Adams, and finally Mr. Eltinge himself, who has a natural aptitude for combining color and texture in ways which tell, and whose deft hand in this regard has left a pleasant wake everywhere throughout the house. The dining room has very pronounced trowel marking on the wall too pronounced it would have been had it not been redeemed with a very beautiful color which is a sort of green burnished gold, and with a delicately modeled frieze also finished in gold. There is a very loyely painted mantelpiece on one side in blue and yellow; the doors are of plain smooth boards colored to match the walls, and in place of knobs there are very simple iron latches. The floors have been finished with the planer marks showing, but done with studied method in effective manner, and are stained dark. Opening off the dining room is a lovely little breakfast room. The bedrooms are on the next floor and are three in number. Two of them might be considered small, but this is compensated for by the richness of their treatment. Mr. Eltinge’s own room is of goodly size and has a bed of interesting Italian design done by the architects, which stands on a dais suggestive of the European throne-room. The rest of the furniture in the room is painted in polychrome and has been extremely well done. A bath room opens at one side, the floor consisting of irregularly shaped brown tile laid with wide joints. One of the guest rooms has a very charming covered balcony opening off from it (the tower balcony) from which the views over the lake and mountains may be enjoyed. All of the bedrooms have trowel marked plastered walls, but attention has been paid to having it appear natural and the coloring is exceptionally good. In the room with the balcony it is almost iridescent, while in Mr. Eltinge’s own room the pattern of the brocade window hangings has been stencilled upon the, walls in such a manner as to have it faintly appear in places and disappear in others in a most effective manner. In all these rooms the wall color does not extend to the ceiling, but has been terminated near it with an outline of different kinds suggestive of mediaevalism, one pattern being that of castellation and the others equally appropriate. One very interesting room passed by in my description of the ground floor opens off the entrance hall. Mr. Eltinge calls it the “trick room.” In a way it is appropriately named, for its walls are covered with photographs of famous actors and actresses with various personal inscriptions upon them which make it very interesting; a description of the house would not be complete without mention of it. It is comfortably furnished and plays the part of a man’s smoking or retiring room. Taking it altogether Mr. Eltinge’s house is distinctly the home of an actor. Southern California has in the last few years become a mecca for moving picture people, and while Mr. Eltinge’s reputation was made on the “legitimate,” long before the “screen” became so popular, he has nevertheless made brief excursions into filmdom and so may be considered in that connection. Much money has been made out of the “pictures” and a good deal of it put into homes. His house is one of the few of these which are distinctly creditable. It has received much comment, not all of which I regret to say has been favorable; but I think this is because it has not been understood. It seems to me that an actor’s home should be romantic and picturesque, and different from the homes of other men and women. Actors deal in their work with the romantic and picturesque, they must perforce become saturated with it ; and it is appropriate and natural, therefore, that such spirit be reflected in their homes. Mr. Eltinge’s house does express the romantic spirit in a beautiful manner. 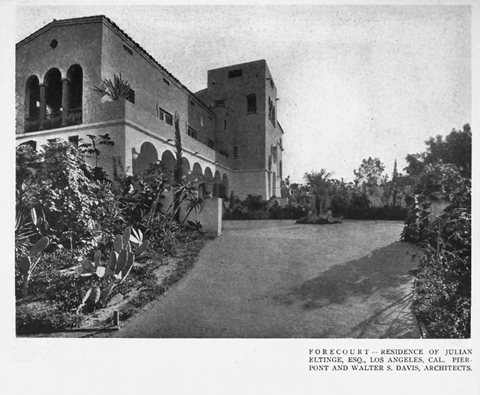 This entry was posted in 1921, Architecture, Found on EBay, Interior Design, Lesbian, Gay, Bisexual, Transgender, Stage and tagged #Julian Eltinge, #la, #Silver Lake, Architecture. Bookmark the permalink. I am happy to say that at least the front and lobby of the Eltinge Theater on 42nd Street (now the AMC Movie Theater) still exists. The entrance is one of the loveliest in Times Square, and for years it was abandoned and threatened with demolition. Lovely home, and fits in with the Spanish Revival spirit of the times. This is one of the few actors’ homes of the period that survives. It’s interesting how they keep repeating that this is a man’s house, did they feel they needed to do that because of his career? I wish we could see that “trick room” with all the signed photographs though. @Mary: I suppose the “trick room” was precursor of the “man cave.” Eltinge was a victim of changing times. He was a sensation in the early part of his career, but quite marginalized toward the end. It’s a very sad story and would make a great movie. On m list of places to visit when traveling back in time, LA in the 20’s is in the top ten. Another great example of when LA was becoming great because innovative, creative people came here and made at least some of their dreams not only come true, but inspire the rest of us. Today’s LA seems like a boring, washed out facsimile. And yes, destroying library books for greed or ego of collecting is a crime against humanity. work on the house. I have the original sales receipt signed by Julian Eltinge.